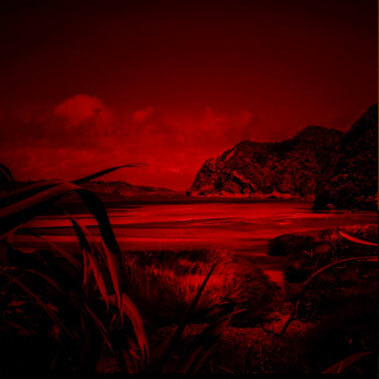 Pip Guthrie, Taranaki photographer, has created a visual essay that explores the journey of Whare Matangi who followed a magic dart from Kāwhia to Waitara in search of his father, a local chief, Ngārue. Pip has been a photographer all her life. She began developing black and white film in her father’s photographic studio at the age of eight. She has spent many years overseas but has always come home to Taranaki. Her time spent overseas ranged from prawn trawlers and mining in the Northern Territory, a fish factory in Iceland to working in the photographic department of the National Gallery, London. Photographic jobs took her from Oman and then back to Melbourne. Twenty years ago she returned to New Zealand and has lived the last six years in Waitara. This has lead to learning about the journey that is the subject of this exhibition. Ōwae Whai Tara marae in Waitara (Whaitara) has carved on its entrance gateway the story of Whare Matangi who went in search of his father. Whare Matangi lived with his mother’s (Uru te Kakara) people in Kāwhia but yearned to find out who his father was. His father (Ngārue) had left Kāwhia to return to his own people in Waitara before Whare Matangi was born. Growing up, Whare Matangi became very skilled at a game called niti which used toetoe stems as darts which were bounced off mounds of earth to see who could reach the furthest. Upon reaching adulthood his mother gave him a magic dart and told him to throw it five times and it would bring him to his father. The dart took him to Nukuhakari, Mokau, Parininihi (White Cliffs), Motunui and finally Waitara where it hit the barge boards of his father’s house. There he stayed, married and brought up his family. A more detailed version of this story can be found at this link. Pip’s beautiful photographs evoke a sense of the mystical and bring to the fore the powerful spiritual aspects of these ancient landscapes that speak of a time and people from long ago. 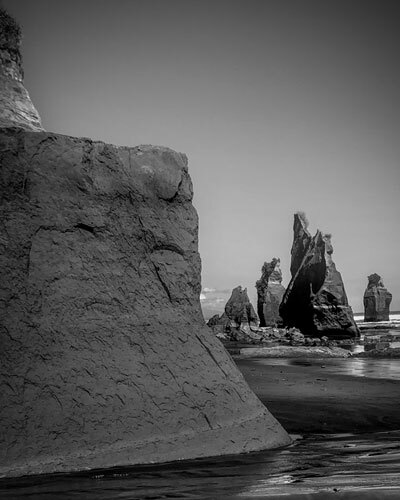 These images transport the viewer away from the present moment and into an ethereal version of this coastline joining Whare Matangi on his quest. Pip explains that her vision for this exhibition will be to “re-engage the name of our ‘Whaitara’ in a way that connects people to the landscape and to this journey that is the town’s namesake.” Whai-tara means to follow the dart. It is said that this odyssey occurred in November circa 1420. It is fitting then that Pip is showing her work here in Mokau, halfway through Whare Matangi’s journey, in the month of November. This exhibition is the first showing of this work which will be ongoing as Pip explores the beauty of this isolated coastline that many have never seen. The continuing journey will capture the landscape from land, air and sea in the hauntingly beautiful moments of dusk and dawn. Prints of the photographs will be for sale to help support the future of this project. There will be an opening day on Saturday 3rd November 10am – 4pm, for people to talk to the artist and share in some light refreshment. Pip would like to thank the New Plymouth District Council Creative Communities Scheme and Smokeylemon Digital Marketing Agency , Tours For You and Mokau Museum + Art Gallery for funding and support towards with this exhibition.